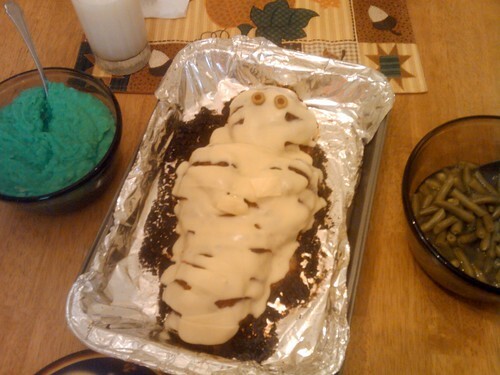 Mummy meatloaf and green mashed potatoes, originally uploaded by MCuthbert. This is why my wife is awesome. Check out the Halloween-themed dinner she made tonight. Dressed up for Trunk-or-Treat, originally uploaded by MCuthbert. Sunday night was Trunk-or-Treat at our church. I didn't get any good photos, but someone posted this one on the Homewood Children's Ministry Facebook page. Beautiful. Emily was having a tantrum today as we were getting ready for lunch. So of course I grabbed the video camera to record it. Threatened with showing this video to her hypothetical future boyfriends, Emily ran from the kitchen screaming and slammed her bedroom door. The sign on her door adds delicious irony to her meltdown. Posting this probably makes me a candidate for worst parent ever. Children of the corn, originally uploaded by MCuthbert. For a long time, I've wanted to take the girls to a corn field maze. Misty and I hadn't been to once since before they were born, but up until now, we didn't think their little legs could handle all the walking -- especially when you don't know how much of it there will be. This year we finally took the plunge and made a trip to The Maize in Huntsville. We had to time our visit just right so that we could arrive during daylight hours on a day when the maze wasn't categorized as "haunted." We didn't want Jason Voorhees jumping out at the girls with a chainsaw. On our way there, we stopped at the Huntsville Botanical Gardens, since I had some free tickets for their scarecrow trail. I'd never been to the HBG before, but I was impressed. There was a lot of stuff there aimed at kids -- including an entire Chilren's Garden -- and Emily and Kendall loved it. Aside from checking out dozens of themed scarecrows, they climed inside a giant flower pot, played in Dorothy's house that had fallen on the Witch of the East, made their way through a miniature hedge maze, and saw sculptures of Frog and Toad. Unfortunately, the mini-maze did not quite prepare them for a full-scale corn field maze. The Maize was broken into two sections -- the first half of which we completed in a relatively short amount of time. I don't know if the second half was much harder, or if we just got lucky the first time, but we kept finding outselves back at the same spots again and again. All the while, the staff was setting up for the evening's haunted scenes as the sun sank lower in the sky. Kendall and Emily began to get really frustrated with all the walking (particularly since it turned out that we weren't really going anywhere), so eventually we had to cheat, hopping over a barrier and reversing our path to exit the way we came in. Misty and I had fun, but the girls weren't really fans of being lost amid the stalks of corn. Afterward, we returned to town for dinner at our favorite Mexican buffet only to find that it was gone. Not just closed -- the whole building had been demolished. Luckily, after some investigating, we learned that the restaurant had only changed locations, and the new spot was nearby. It turned out that La Alameda now occupies the old Mill restaurant location. It was really strange sitting there in the same spot where I'd eaten so many times as a student at UAH. Almost all of the interior was the same. We rounded out the evening with a walk through Bridge Street Town Centre. We listened to street musicians, rode the carousel, watched the gondola and paddle boats, checked out a couple of stores, and made wishes in a fountain with pennies. Kendall's wishes are always easily attainable -- along the lines of: "I wish I could spend the night at Mimi's house" -- whereas Emily's tend to be somewhat less so -- things like: "I wish we could put this fountain in my bedroom." All in all, it was another enjoyable visit to Huntsville.